Recorded as Howie and Howey, this famous Scottish name is locational. It derives from an estate known a "The lands of How" in the county of Ayrshire, although the precise location is now lost. The name therefore is a member of the ever growing list of surnames of the British Isles that originate from lost medieval sites. It is claimed that the origin is from the Ancient British-Strathclyde 'hoh', a word which pre-dates written history, and describes a hollow or deep valley, from which also developed the surname How or Howe. 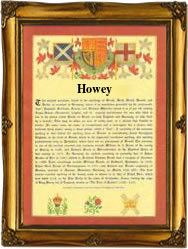 The name as Howie or Howey is probably a diminutive meaning Little How, the suffix 'ie' or 'y' being a popular Scottish and North of England endearment. Early examples of the surname recordings include John Howy, a servant of the Earl of Cassilis, who in 1526 was accused of murder , however all was well, he was reprieved! Somewhat less dramatically in 1590 Robert Howie was recorded as being the Principal of Marischal College, Aberdeen, whilst in the year of 1625, Archibald Howey was elected a burgess of Glasgow. John Howie (1736-1793), wrote the long accepted standard work called 'The Scots Worthies', published in 1774. Interestingly the Ayrshire nameholders have a long tradition that they descended from Flemish weavers, who escaped persecution in their homelands. Although unlikely this should not be ruled out, in which case like many refugees before them, and no doubt many in the future, they appear to have adopted or adapted a local surname to their needs. The first recorded spelling of the family name is shown to be that of William Howye. This was dated 1526, when he was appointed Sergeant at Arms of the town of Brechin, during the reign of King James V of Scotland, 1513 -1542. Surnames became necessary when governments introduced personal taxation. In England this was sometimes known as Poll Tax. Throughout the centuries, surnames in every country have continued to "develop" often leading to astonishing variants of the original spelling.